Expansion of a silicon particle accompanying charging. Under an electric current of 3nA, a silicon particle expansion process was observed. As a copper plating was applied to the tip of the probe, the tip displays a copper-brown color. The black silicon particle (with partial metallic gloss), which is in contact with the probe, undergoes swelling accompanying charging (in red circle). Researchers from the National Institute for Materials Science and Tokyo Metropolitan University have succeeded in measuring the volumetric expansion of single particles of silicon, which is a negative electrode material for lithium (Li) ion batteries, accompanying the charging reaction, and demonstrated the importance of electrode design from the viewpoint of volumetric energy density. Li-ion batteries are a type of secondary cell in which a Li-containing transition metal oxide is used as the positive electrode and graphite is used as the negative electrode. Because Li-ion batteries have high energy density in comparison with other secondary cells, such as nickel-metal hydride (NIMH) batteries, etc., they are widely used as a power source for mobile electronics, and are also considered promising for electric vehicle (EV) and stationary power storage applications. At present, graphite is used as the negative electrode material, but in order to achieve higher energy density, materials which utilize the alloying reaction with lithium, represented by silicon, have attracted attention as next-generation negative electrode materials. The most important issues for practical application are elucidation of the mechanism of the large volume change which occur in the charging and discharging reactions, and control of those changes. A research group at Tokyo Metropolitan University established the technology of a single-particle measurement system to investigate the intrinsic electrochemical properties of single particles of electrode materials for Li-ion batteries. In the present research, this system was introduced in the ultra-dry room at the NIMS Global Research Center for Environment and Energy based on Nanomaterials Science (GREEN), and was used to perform electrochemical measurements of single particles (10-20μm) of silicon, which is seen as a next-generation negative electrode material. To date, the expansion ratio, etc. of single particles of silicon had been estimated from the theoretical crystal size, and volumetric changes accompanying the charging and discharging reactions had not been evaluated quantitatively. 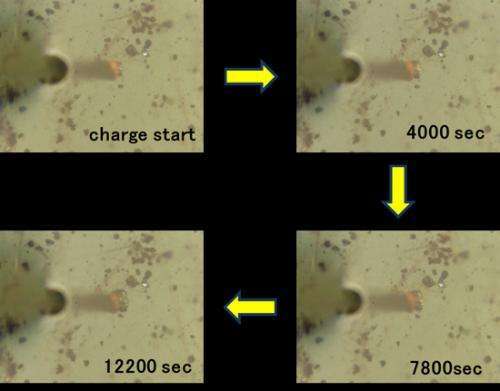 This research result was the world's first example of successful measurement of volumetric expansion of a single particle of silicon accompanying the charging reaction. The results of this experiment clarified the fact that the volumetric expansion of silicon in the charging reaction is larger than the value estimated theoretically. Although this is thought to be due to the formation of an amorphous phase, etc. as the alloying reaction between the lithium and silicon proceeds, further study will be necessary in order to elucidate the detailed mechanism. Standards have now been established for Li-ion batteries for electric vehicle (EV) and cellphone applications. Conventionally, evaluations of material performance had centered on energy density per unit of mass. However, volumetric energy density is increasingly considered more important than mass energy density. As the present research showed, silicon displays larger volumetric expansion than the predicted value, which results in a decrease in real energy density. Thus, this research demonstrated the importance of actual measurement of volumetric expansion in the search for candidates for next-generation battery materials. As described above, this research showed the importance of measuring the actual volumetric energy density when adopting a material that displays volumetric changes during charging/discharging in the electrodes of Li-ion batteries. Based on this result, electrode design guidelines which also consider volumetric changes are necessary in research and development in the search for next-generation materials for Li-ion batteries. These research results was presented at the 80th Spring Meeting of the Electrochemical Society of Japan, which was held at Tohoku University on March 29.